In order to avoid damage to your KeyMaker Board as well as the ThinkPad you are using it on, there are certain precautions you MUST observe. If you ignore these precautions you will join the 3% of customers who bought a KeyMaker board - ignored these precautions and damaged their KeyMaker Board by being careless - then had to pay to have it replaced - and lost a lot of time in the process. Your KeyMaker has electrical contacts on both sides, you must ensure that no part of your KeyMaker USB board comes into contact with any conductive surfaces such as bare metal or bare wires. You should place down a piece of paper and place your KeyMaker USB on top of it in order to avoid any electrical contact which may damage your KeyMaker. There is no danger of receiving an electrical shock from your KeyMaker USB as the highest voltage anywhere on the board is 5 Volts which is a safe voltage to touch. If you prefer you can place your KeyMaker USB board inside an Anti-Static plastic bag during use, the board does not get warm at all, so there is no issue with ventilation. The same precautions apply to your ThinkPad when you are performing any operation and BEFORE your ThinkPad is switched ON, you must ensure that nothing can short out by coming into contact with other parts, you can use sheets of plastic or plain paper to make sure things remain electrically isolated. You have traced the wire you are using for your probe right back to the label on the I2C header on the KeyMaker board which reads SDA for YOUR SDA lead and reads SCL for YOUR SCL lead. 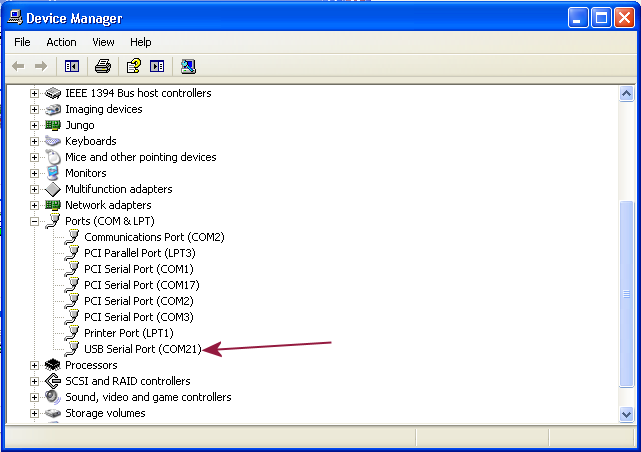 You have absolutely confirmed that you have correctly identified the SDA and SCL connection points on your ThinkPad System Board. 3% of customers who purchased a KeyMaker Board have somehow managed to damaged their KeyMaker board. NOT ONE of those customers can tell me exactly what he or she did to damage it. I have tried all sorts of seriously ridiculous ways to damage a KeyMaker board and I have NOT BEEN ABLE TO DAMAGE ONE ! I only tried MILDLY STUPID THINGS like connecting a solid 9 Volt source to SDA and SCL - theoretically that should have damaged the I/O pin on that KeyMaker powered from 3.3 Volts, IT DIDN'T. Your KeyMaker board is a delicate piece of equipment, treat it with respect. Do NOT experiment or connect to anything if you are not certain you have the correct connection points identified. There are voltages much higher than 3.3 Volts inside your ThinkPad, in fact up to 20 Volts. 20 Volts is not a danger to YOU but it is to the KeyMaker KMX1 or KMX2. All of Joe's KeyMaker KMX1, KMX1 PRO and KMX1 PRO S are shipped NOT Activated. KMX1 will do NOTHING useful until it has been activated ! 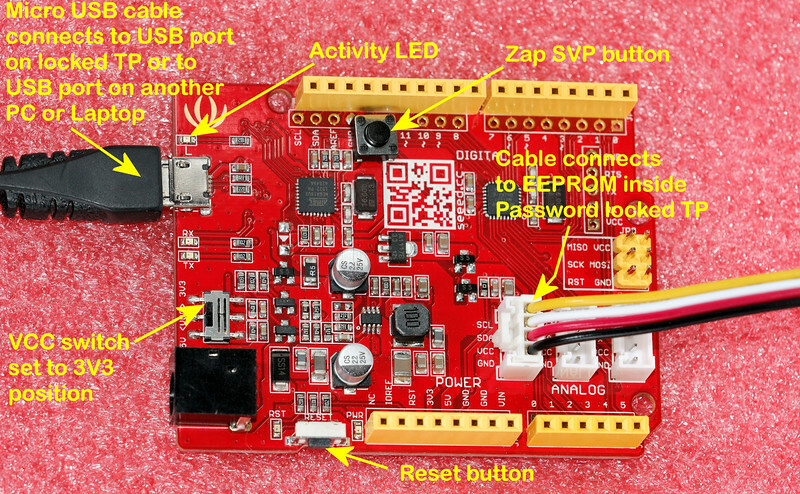 Before you can use your KMX1, KMX1 PRO or KMX1 PRO S KeyMaker board you must Activate it. KMX1 board will do nothing useful until it has been Activated, it will simply sit there if powered up and display a constantly flashing Activity LED which is it's way of telling you it has not been Activated. 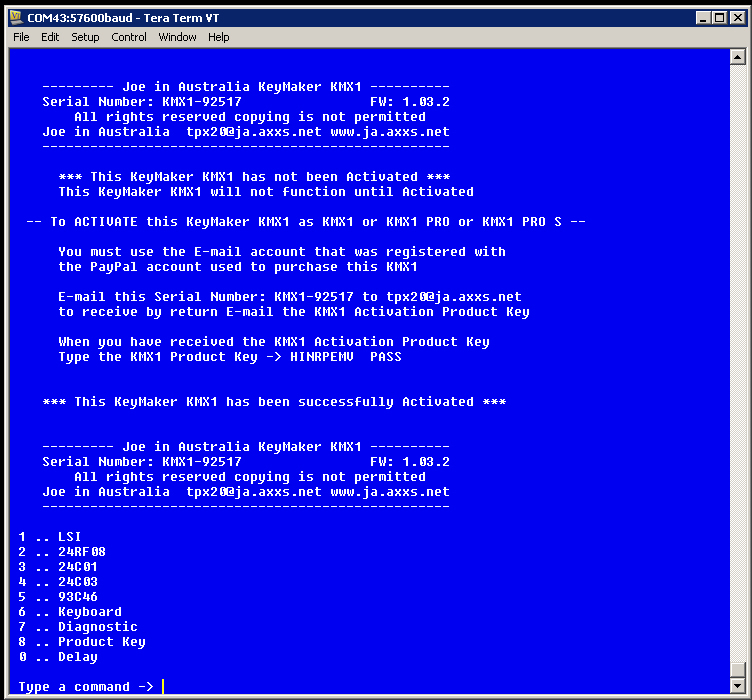 The Zap SVP will NOT work until after the KMX1 board has been Activated. Put simply, do not waste your time trying to use the KMX1 board until after it has been Activated. Activation involves using a PC or Laptop - another PC or Laptop, NOT the Locked ThinkPad which obviously cannot run any programs. 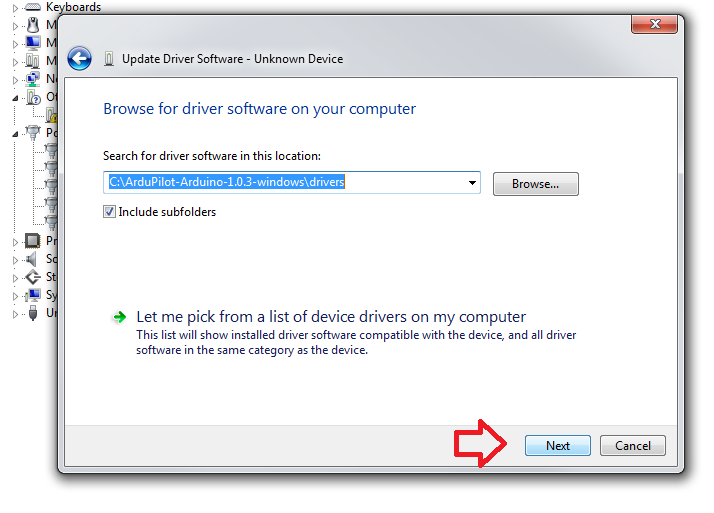 On that other PC or Laptop you will most likely need to install USB Drivers. You will then need to install a Terminal Program and connect the KMX1 board via a mini or micro USB cable to that PC or Laptop so that you can see on the PC or Laptop screen messages displayed by KMX1 and type in commands and serial numbers which will be received by the KMX1 board. 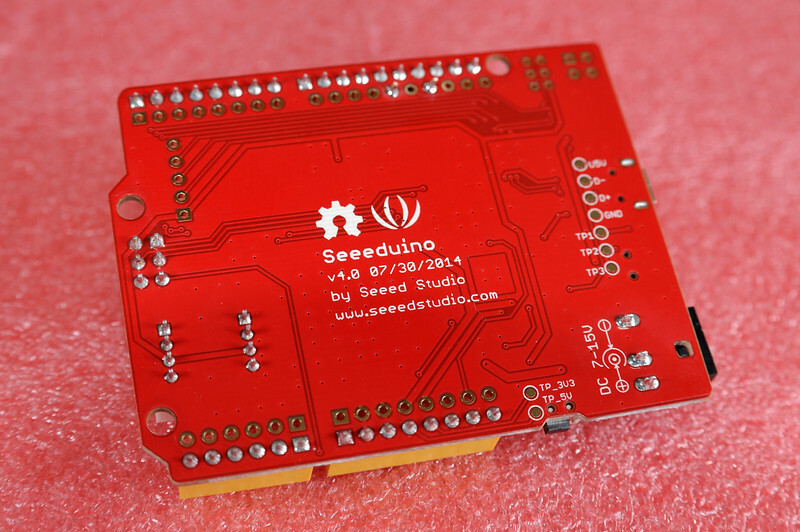 If you have a v4.2 KMX1 board like the one depicted in the 2 photos below you install Seeeduino v4.2 USB Drivers, see instructions immediately below, else you scroll down to find instructions for USB Drivers for your KMX1 board version. 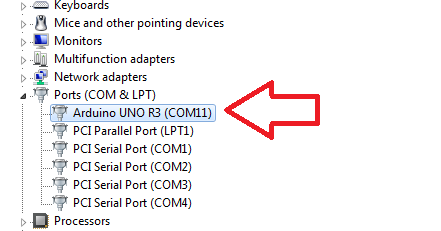 Windows 10 installs the correct driver so there is no driver to install, please scroll down to "Install Terminal Software"
please scroll down to "Install Terminal Software"
If you have a v4.0 KMX1 board like the one depicted below you install Arduino USB Drivers, else you scroll down to find instructions for USB Drivers for your KMX1 board version. It can take quite a while to download that file, When the download finishes, unzip the downloaded file into a folder, we will not be installing nor running any Arduino software. 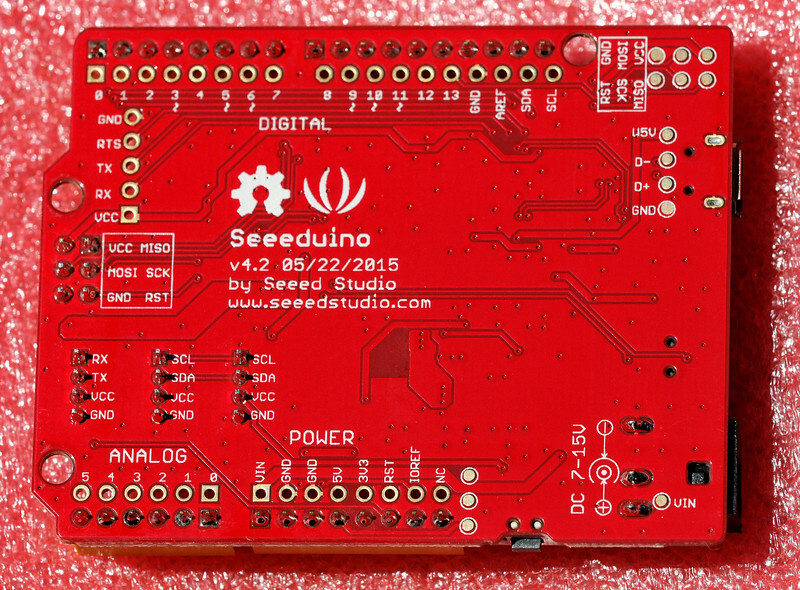 The only thing we need from the Arduino Software is the USB driver for Arduino UNO. Take note of the name of the folder to which you unzip the Arduino software as you will soon need to navigate to that folder to install the USB drivers further down this page. The KMX1 v4.0 board draws power from the micro USB connector, connect a micro USB cable between KMX1 and your PC or Laptop USB port. The green power LED to the right of the Reset button should go on. Look under Ports (COM & LPT). You should see an open port named "Arduino UNO (COMxx)". 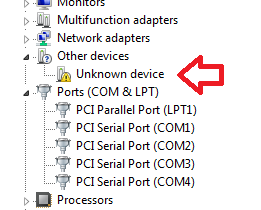 If there is no Arduino UNO (COMxx), then look under "Other Devices" for "Unknown Device". 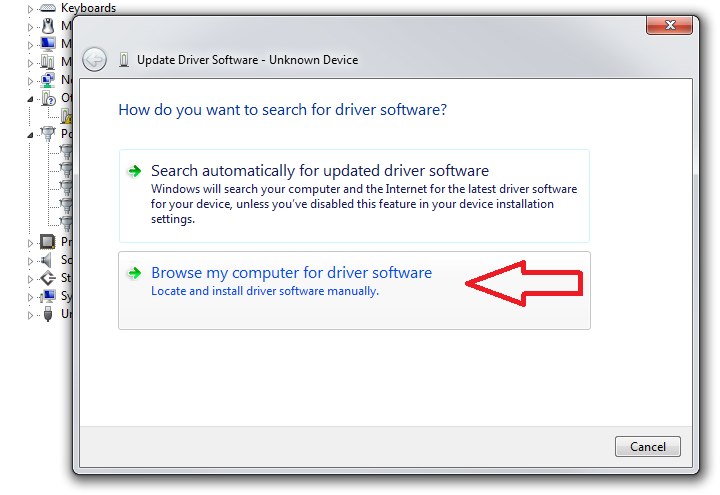 Right click on the "Unknown Device" port and choose the "Update Driver Software" option. choose the "Browse my computer for Driver software" option. 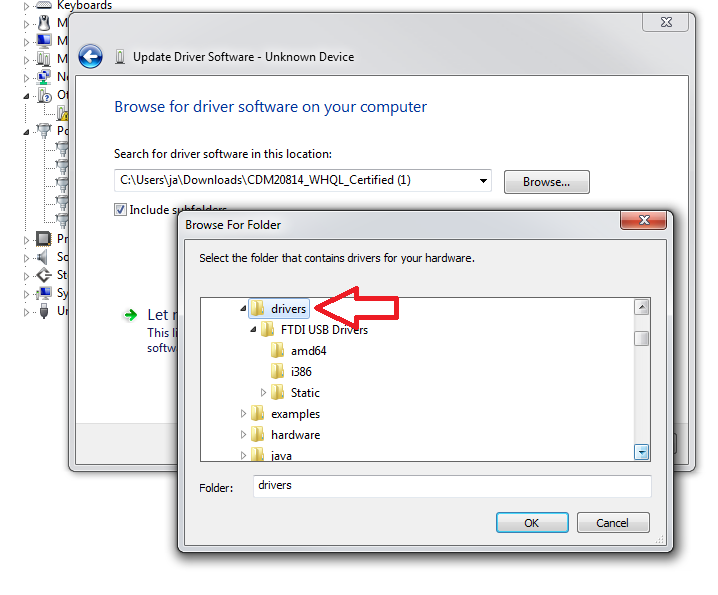 Navigate to and select the "Drivers" folder of the Arduino Software you downloaded and unziped earlier (not the "FTDI USB Drivers" sub-directory). 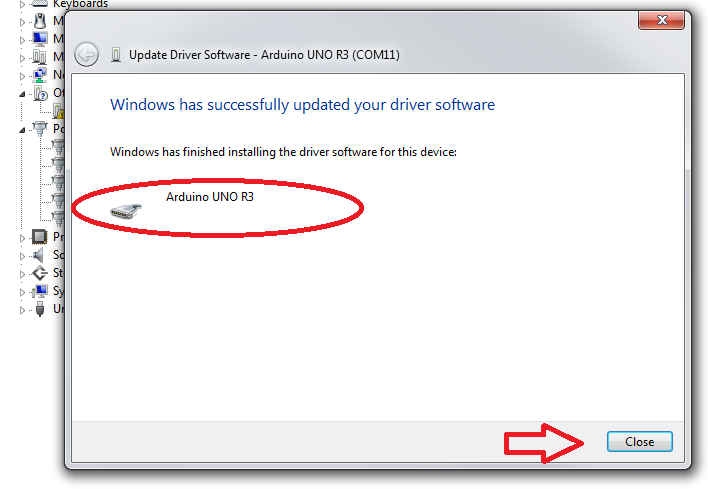 Then click "OK"
Windows may display a Security Warning, select "Install this driver anyway"
Once Windows has successfully updated the USB driver it should display it as "Arduino UNO", click "Close"
You should now see the Arduino UNO and the COM Port assigned to it. 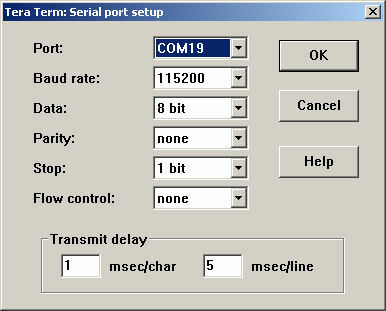 Take note of the COM Port number as you will need it later when running the Terminal Software. If you are running Windows 7 either 32 or 64 bits, you usually do NOT need to install any drivers as Windows 7 will automatically recognize KMX1 and install the correct drivers. FTDI the manufacturer of the FTDI FT232RL USB chip used in KMX1 has drivers as well as comprehensive guides to install those drivers in all the applicable Operating Systems. Please review ALL the instructions from FTDI first before doing anything. When you have a clear picture of the entire process, only then follow the FTDI instructions. You should install the FTDI drivers BEFORE you connect your KMX1 to a PC, if possible. Temptation is to just connect the board to a PC and assume that Windows knows all about it. 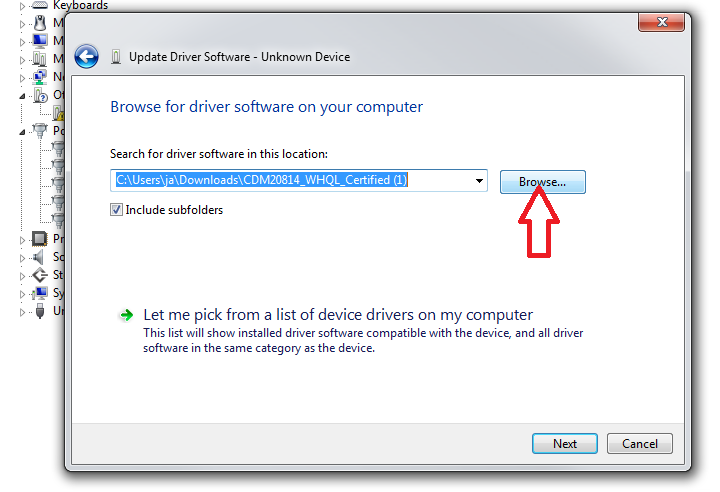 If you let it Windows will automatically install some drivers which may be old and not the correct drivers. If possible, it is best to install FTDI DRIVERS FIRST before you plug your KMX1 into a PC USB port, DO NOT just blindly say OK to everything Windows suggests, first read what is being suggested. If you have the latest Operating System and it is up to date then it should easily find the FTDI FT232RL and install the correct drivers automatically. Before your KMX1 can do anything useful, you need to connect a mini or micro USB cable to it, the other end of the cable should be plugged into a PC or Laptop that is switched ON, that will supply power to KMX1. The same boards are used for KMX1, KMX1 PRO and KMX1 PRO S, the differences arise depending on which product keys are used to Activate it to enable various levels of functionality. The Green Power LED [just to the right of the RESET Button] light up and stay ON. The activity LED flashing continuously which indicates that this KMX1 has NOT been Activated yet. Your KMX1 is switched ON and ready to be Activated. To Switch your KMX1 OFF you unplug the mini or micro USB cable. There are a lot of different Terminal Software programs out there, most are free. Windows comes with a Terminal Program called Hyperlink which you can access by Start - All Programs - Accessories - Communications - Hyper Terminal. 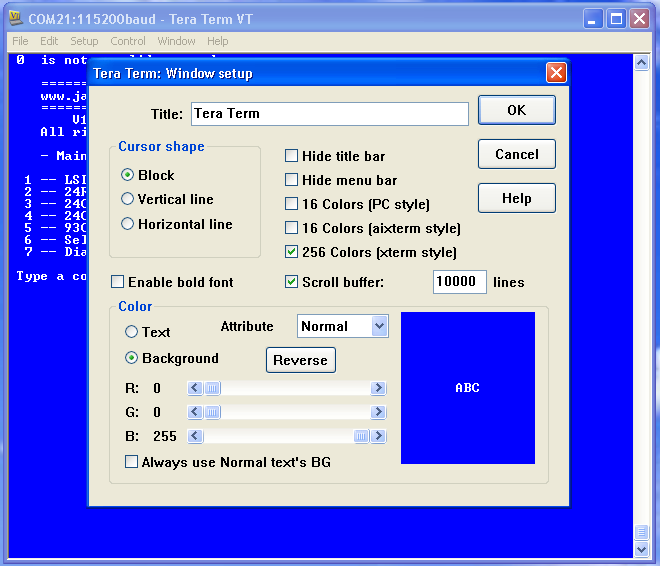 I prefer to use a program called Tera Term which is available for Download here tera term save the downloaded file to your computer then run the exe file just like any other Windows program to Install it. If you run another operating system then you will need to search the net for a suitable Terminal Software program for your Operating System. 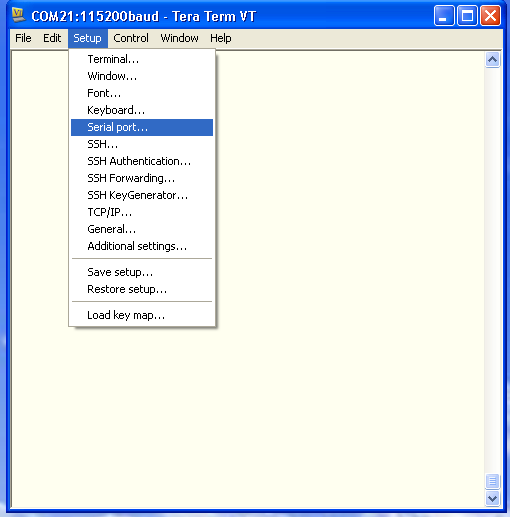 The following is about Tera Term running under Windows however you can use this as a guide for most Terminal Software. The USB interface on the KMX1 board and the FTDI Drivers act as a USB Serial COM Port to which Windows assigns a COM Port Number. earlier revision boards have 2 slider switches on the left side. Top one should always be over to the left as in the above photo. The next switch should always be over to the left as in the above photo. Down the bottom left, you have the RESET Button, which we will be using further down this page, to the right of the RESET Button is the green Power LED which lights up whenever the KMX1 is powered up. On the right, the 4 wire cable has been plugged in over the I2C Header pins, NOTE: the RED wire goes over the VCC pin. On the top left you also have the ZAP SVP button. 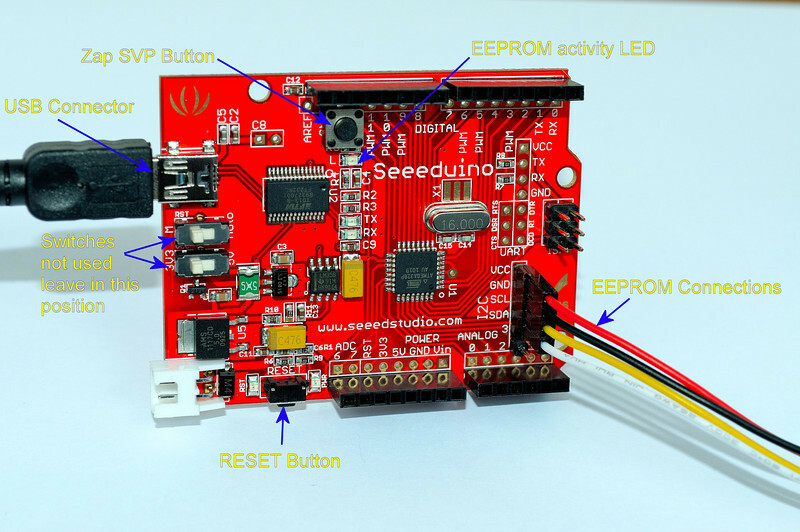 There is also the Activity LED [Green coloured LED on earlier boards Blue coloured LED on V4.0 boards] which is used to signal EEPROM activity, it is lit and stays lit while the KMX1 board I2C cable is accessing the eeprom connected to the other end of the I2C cable. The Activity LED is also used to indicate if the KMX1 has been Activated or not as well as to signal success or failure of EEPROM operations. If the KMX1 has not been Activated the Activity LED will flash constantly. After the KMX1 board has been activated when you power up the KMX1 board the LED will flash 4 times and then remain OFF to indicate the KMX1 board has been Activated and ready to be used. I should mention at this point that it is better to power up [plug in the mini or micro USB cable connected to a PC or Laptop which is switched ON] before you run your Terminal Software. The reason being that until KMX1 is turned on its COM Port doesn't exist, so your Terminal Program would not find it which can be frustrating if you don't realize what's happening. So power up KMX1 ON first, then run your Terminal Software. 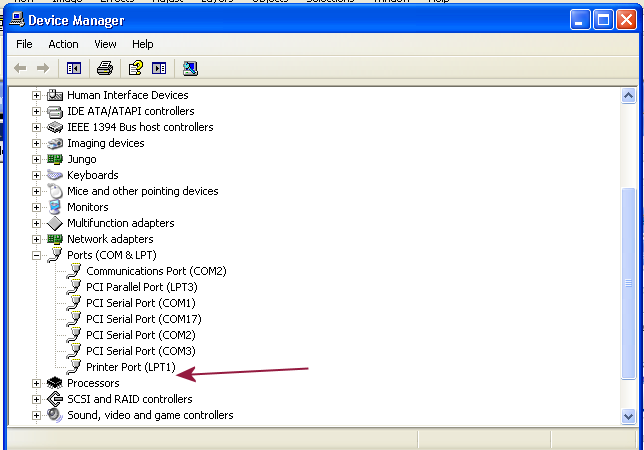 Select the COM Port that was allocated to KMX1 during the USB Driver installation. Save all these setting so you don't have to do this again. 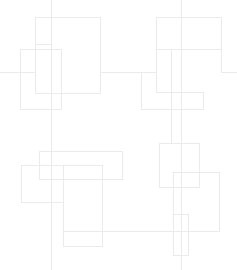 On some Terminal programs you also need to CONNECT before anything useful happens. You get there by - Setup - Serial port..
Each of the settings has a drop down menu which allows you to chose the correct settings, click OK when done. To save those settings, you would chose - Setup - Save setup - type in a name and click Ok, now each time Tera term is run it starts up with all the correct settings. Press the Reset button on KMX1, Bottom left of board black coloured push button labelled RESET. You should see the KMX1 Product Activation Screen with the cursor blinking ready for you to type in your KMX1 Activation Product Key, the background and Text colours will vary depending on your settings. If you see no characters displayed you may not have correctly installed USB drivers. If your KMX1 requires FTDI drivers it may be that you installed 2 incorrect FTDI drivers. 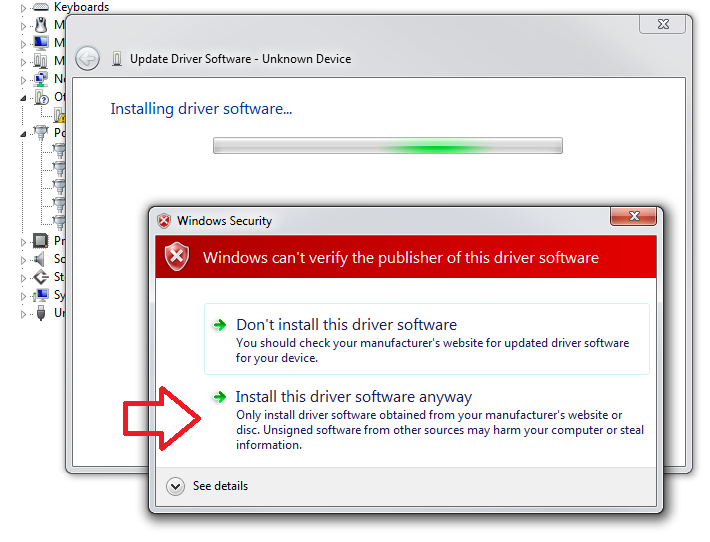 You need to uninstall those 2 incorrect drivers. If you have a KMX1 v4 or V4.2, scroll to the beginning of this page and install Arduino USB driver. Don't concern yourself with Activation right now that is fully covered later, for now lets get KMX1 to display something. If nothing appears on your PC or Laptop screen. Watch the KMX1 board while pressing and releasing KMX1's RESET button which is next to the illuminated GREEN Power LED. 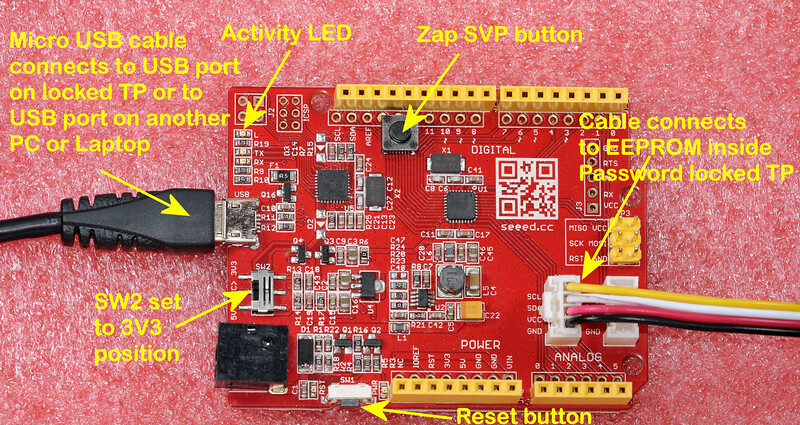 Each time you press and release the reset button you should see a RED LED on middle of the KMX1 board flash very briefly, that is the TX LED which flashes any time serial data is being sent out by KMX1 to your computer via the USB Port. If the RED LED flashes it confirms all is well as your board is indeed sending out the Initial Activation Screen to your computer but you are not seeing it. 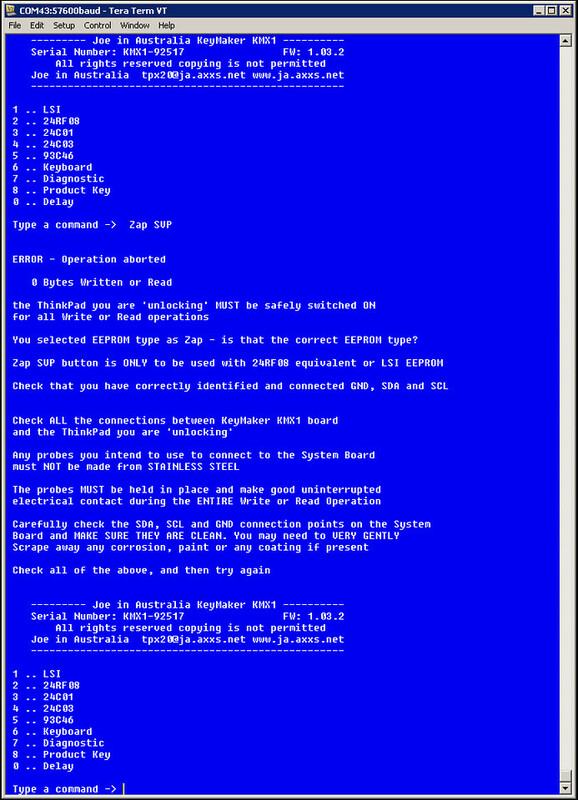 The usual cause for not seeing anything on the screen is you have NOT selected the correct COM Port connected to the KMX1 board. The System Properties window should appear. Which call cause it to Expand and display all available Ports. Watch that list while you unplug the mini or micro USB cable from your KMX1 board for a few seconds then plug it back in again. The COM port that disappears each time you unplug the mini USB and re-appears when you plug it back in is the COM Port assigned to KMX1 by Windows and the FTDI or Arduino USB Driver. 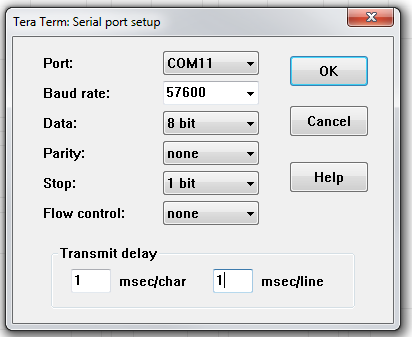 Now you know for sure what is the correct COM Port, go back to your terminal Software and select that COM Port. NOTE: In the images displayed below, THE BACKGROUND is NOT from a KMX1 so ignore the background. 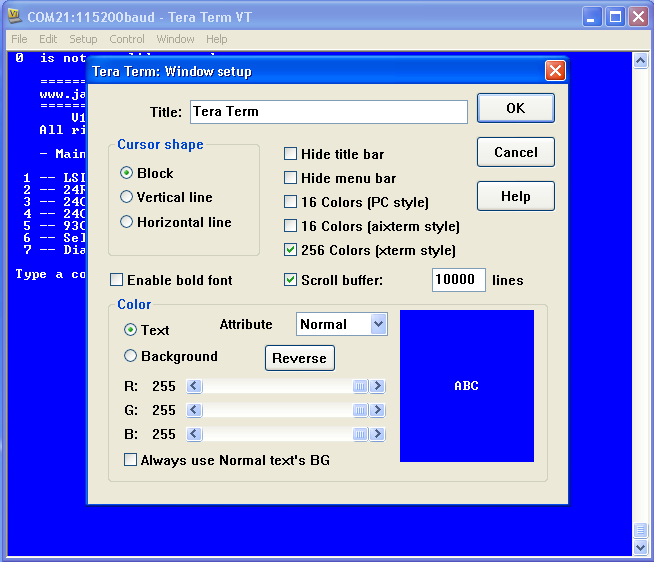 Setting Tera Term colours for background and text can be customized by clicking Setup - Window.. The Serial Number of the KMX1 you are Activating will be a different number it will NOT be KMX1-38692. Every KMX1 has a Unique Serial Number and a Unique Activation Product Key that ONLY works on that Serial Number KMX1. You need to email me the serial number displayed by the KMX1 you are activating. DO NOT email me the sample serial number KMX1-92517 as that is NOT the serial of the KMX1 you are activating. You email me the Serial Number displayed by the KMX1 you are activating. By return email. to your PayPal registered email address. you will receive your unique 8 alpha character Activation Product Key that you can type in at the Initial Activation menu. Depending on which KMX1 you purchased. Your Product Activation key will Activate your KMX1 to that level of functionality. See examples below for KMX1, KMX1PRO and KMX1PROS Activation. Activation ONLY needs to be performed once and remains in effect forever. With your KMX1 Activated now is a good time to become familiar with how the SVP Zap button works. 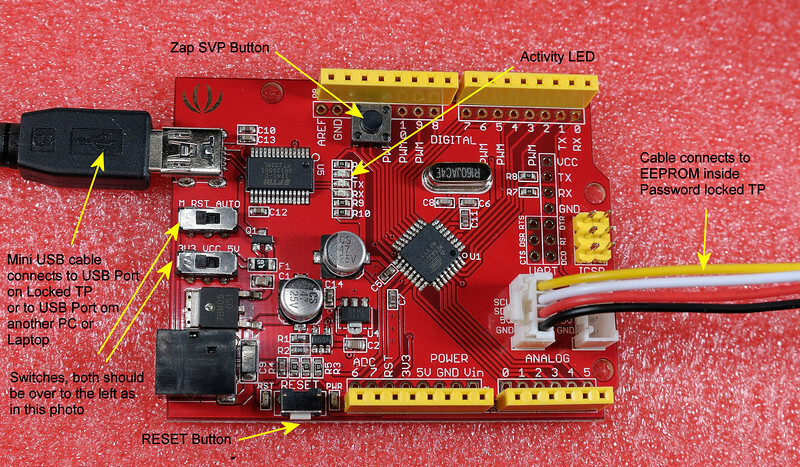 It is safe to operate the Zap SVP button without any EEPROM connected. It will fail almost immediately and give a short burst of fast flashes on the Green EEPROM Activity LED which indicates a failed Zap SVP operation, in this case it fails because obviously it can't find an EEPROM since none is connected. Following the delay the Green EEPROM Activity LED will stay lit steady briefly and when the Zap SVP operation fails you will see the Green EEPROM Activity LED display a burst of quick flashes [signalling failed operation] then go out, you also see this error message displayed. 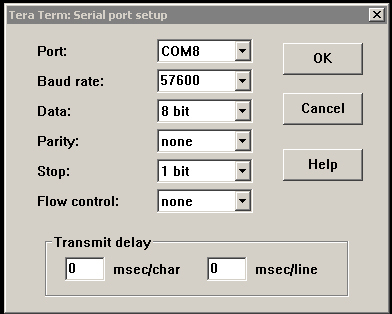 Bottom line displays EEPROM Type, currently set delay time and Keyboard Country.